How to think in ways that allowed astronauts to do things no humans had done before. Robert Kurson, Bestselling Author of "Rocket Men: The Daring Odyssey of Apollo 8 and the Astronauts Who Made Man's First Journey to the Moon"
In 1961, President John F. Kennedy stunned the country by promising that America would land men on the Moon and return them safely by the end of the decade. That announcement came as a surprise to many at NASA; the space agency was just three years old and had little idea about how it would accomplish such a complex and challenging feat, and especially so quickly. One thing NASA did have was seven astronauts, all of them test pilots, and in the next few years the agency would add several more, many of whom would become part of the Apollo program that would set out to keep Kennedy’s promise. These astronauts were not randomly selected. Most came from the ranks of test and fighter pilots, and had already proven in their military careers that they had the requisite courage and daring to press cutting-edge flying machines to their operational limits. And they all believed, even when Kennedy’s promise seemed most impossible, that NASA would make it possible for them to walk on the Moon before 1970. In my new book, ROCKET MEN, I chronicle one of the most incredible and undertold stories in American history – the Apollo 8 mission, launched just a few days before Christmas in 1968. Apollo 8 was mankind’s first journey to the Moon, and remains perhaps the most daring mission NASA ever ran. Apollo 8 had it all: an existential enemy (the Soviets), a race against time that came down to the final hours, breathtaking danger and risk, and an incredible finish, all at the end of one of America’s most divisive and fractious years – 1968. In researching this story, I spent several days with the crew of Apollo 8 – Frank Borman, Jim Lovell, and Bill Anders – and interviewed many more Apollo astronauts. I found that several of these men shared a common style of thinking on certain matters, one that informed their approach not just to their jobs but to their lives. Listed below are six ways I noticed to think in ways that allowed astronauts to do things no humans had done before. Frank Borman spent his pre-NASA years as a test and fighter pilot for the United States Air Force. Whenever word spread around his base that a fellow pilot had been killed in training, Frank’s wife, Susan, became devastated, fearing Frank might be next. Frank, on the other hand, reacted as he always did, by thinking, “It’ll never happen to me because I’m better.” Frank knew that kind of thinking was a defense mechanism; he knew it might not even be true. But he believed himself best nonetheless, and soon enough it became true. NASA picked him for its second group of astronauts, then put him in command of Gemini 7, a two-week orbit of Earth. Three years later, the agency chose him to command Apollo 8, mankind’s first journey to the Moon. As former test and fighter pilots, Apollo astronauts had years of experience pushing aircraft up against – and even past – their operational limits. The risks were immense – many of these men had watched their fellow pilots in the military die in cutting-edge aircraft. But it never occurred to them to stop; there was simply no other way to know the true potential of a machine – or of oneself – without pressing into places others thought impossible. And this instinct didn’t end in airplanes or even in rockets. Many Apollo-era astronauts drove high-performance sportscars, especially Corvettes, the kinds that could testify on a moment’s notice as to what automobiles could do if pressed into a new kind of red. Apollo astronauts trained relentlessly in a command module simulator, an Earth-based model of the Apollo spacecraft they would take to the Moon. The machines were highly accurate mock-ups of the real thing, their cabins outfitted with working versions of every switch, lever, dial, and readout the astronauts would use on their lunar journey. Leading a team of instructors was the Simulation Supervisor, or SimSup. Again and again, the SimSup would unleash an arsenal of emergencies, failures, malfunctions, and conflicts into the simulation, the more catastrophic the better. Often, the crew “died” trying to work its way out of these situations. But the training continued, until repetition began to groove instinct into the astronauts and ground crew alike, and dying helped the men learn to survive. The Apollo missions didn’t just take the first human beings to the Moon, they also gave those humans a perspective on Earth no one before had been privileged to experience. 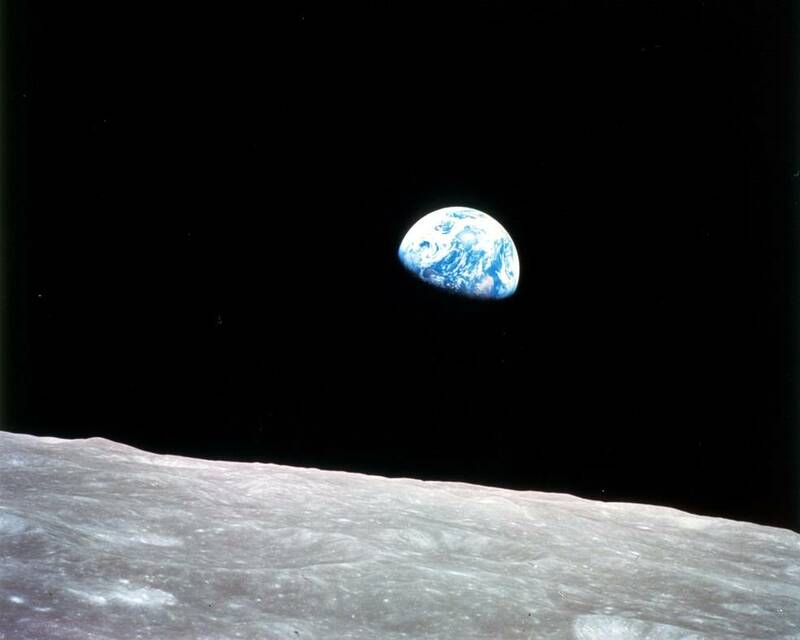 “We see the Earth now, almost as a disk,” radioed Frank Borman to Houston, as Apollo 8 moved away at nearly 20,000 miles per hour. Until then, astronauts had never seen Earth as a whole. Not long after, Earth appeared about the size of a softball to the Apollo 8 crew. It was then that things started looking odd to Bill Anders – thinks weren’t where they were supposed to be, shapes didn’t belong. And then it hit him – there was no up or down in space, or even in the universe. Just because the globes in his grade school classrooms showed Antarctica at Earth’s bottom didn’t mean it would look that way from space. Turning himself upside down, he now understood the continents, the hemispheres, and the shape of a world he’d seen only one way until now. Robert Kurson earned a bachelor’s degree in philosophy from the University of Wisconsin and a law degree from Harvard Law School. His award-winning stories have appeared in The New York Times Magazine, Rolling Stone, and Esquire, where he was a contributing editor. He is the New York Times bestselling author of Shadow Divers, the 2005 American Booksellers Association’s nonfiction Book Sense Book of the Year; Crashing Through, based on Kurson’s 2006 National Magazine Award–winning profile in Esquire of the blind speed skier, CIA analyst, and entrepreneur Mike May; and Pirate Hunters. He lives in Chicago.